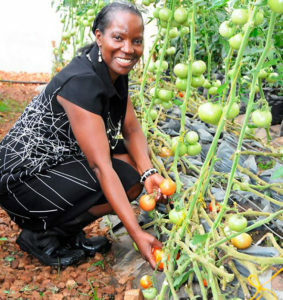 KCCA boss Jennifer Musisi picks fruits at Kyanja Agricultural Resource Centre. Photo by Raymond Mayanja. KAMPALA–Government through its agency, Kampala Capital City Authority KCCA, has this morning, Monday, received a grant of Shs1.7b (Euro 420,000) from Netherlands to expand and improve Kyanja Agricultural Resource Centre located in Kawempe division. Receiving the grant on behalf of KCCA at City Hall in Kampala this morning, the city executive director Jennifer Musisi described the agricultural centre as the boiling point to skill city dwellers in smart urban agricultural initiatives. The agricultural resource centre was set up three years by KCCA to fight unemployment through urban farming. The centre is open for the public to learn how to utilize the small plots of land they have to venture into income generating projects. Some of the crops, the centre teaches, include fruits and vegetables. Piggery farming is also taught at Kyanja. “We set up the agricultural centre to demonstrate to the urban dwellers the possibilities of urban farming,” explained Dr. Micheal Kirya, KCCA’s manager of agribusiness. In Kampala city, where the land is fragmented, Kirya explained that urban farming is possible and can be sustainable. The agricultural centre is one of the initiatives KCCA has put up in place to solve the rampant unemployment in the city. The authority also has the employment resource centre, situated at Nakasero, where unemployed youth are linked to Government and private institutions. Through the National Agricultural Advisory Services (Naad) KCCA is also distributing one-day-old chicks as part of it programme to boost the live hoods of its dwellers. Dr. Esau Galukande,the authority officer in charge of the agricultural centre, advised city dwellers with big compounds to rear birds and animals. “While those with big verandas can engage in vegetable farming. This helps to boost home income,” he advised. KCCA is also asking urban dwellers to invest in horticulture through the use of green houses. Urban farming can be done using green houses, veranda boxes, soil sacks, pots that are hanged on walls, among other forms. Some of the crops, the dwellers can grow include tomatoes, red peppers, onions and greens. To know about modern urban farming, KCCA advised the city dwellers to visit the divisions, where they will interact with the production offices that will help teach them about how to engage in urban farming using the available space they have.